During the May excavations the team was joined by Phil Giles of Pan3Sixty Ltd, a specialist company offering high quality 360° virtual tours, interactive panoramic photography and panoramas. 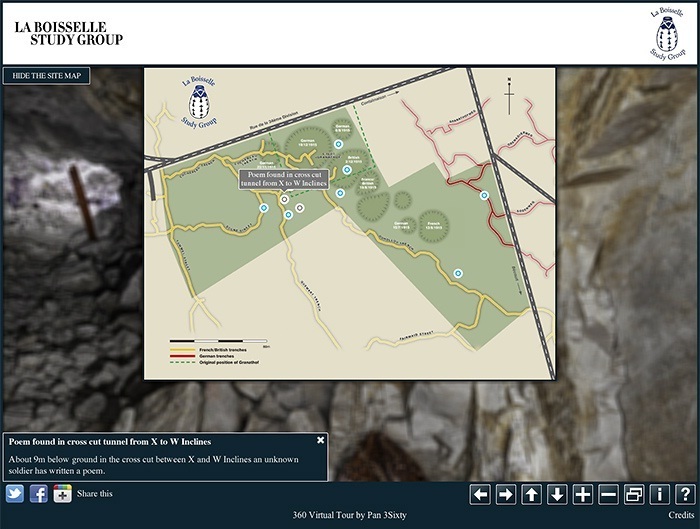 A 360° virtual tour has been created which includes surface features such as trenches, mine craters and ongoing archaeology. There are also five underground panoramas of W Adit, X Incline and the poem in the cross-cut between X and W Inclines. The panorama below shows archaeological work at X Incline, the vestiges of the farm buildings known to the Germans as the Granathof, and a third tunnel entrance, W Incline, in the process of being opened. Please click on the image to launch the panorama in a new window. Hi I visited the site on the 1at of July 2013 with my comrades in the 1st Shankill Some Association.We usually go to the Somme every other year to visit family graves of members family’s who fought and died at the Somme and others sights that effected other colonial countrys who gave the ultimate sacrifice. for king and country.we stumbled across the sight at la bossille by mastake and were met by a young volunteer who was helping the archeologists. He was very knowledgeable and gave us a tour of the site which was of great interest and has inspired me to find out more about the tunneling companys who fought in this sector. All the lads raved about the tour and we will certainly be going back this year. Once again many thanks to Peter and all involved in this significant part of our history and good luck in your quest. Hi, just came across this site while carrying out further research on my great grand father he was in the 183 Tunnelling Company having been seconded from the mines at the age of 47 to the Royal Engineers Tunnelling Company. He in the initial draft to set up the 183 this OC being Captain H.C.B Hickling RE and from my great grand fathers medal card the unit was formed inOctober 1915 and moved to Fontaine-les-Cappy taking over from 2nd Wessex Field Company it was the first company to be deployed south of the river Somme, my great grand father fought with the 183 all through the was and survived having been wounded we believe at the battle of Passchendaele and due to the severity of his wounds and age was subsequently honourably discharged 10th May 1918 he was 132451 Sapper Gavin McKenzie Dunn and died at the age of 73 in 1939. Visited the site on Saturday the 29th September. Great reception from everyone on the site. Made us feel so welcome and learnt so much. I visited back in Easter with my family and so much effoert and hard work has been put into this superb project. Special Tanks to Richard and Jonathan from Chavasse Farm for great hospitality and recommending visiting this wonderful site. I cannot wait to get back and see you all again. Thank you. Phil Giles from Pan 3 Sixty did a great job with these panoramas. Having been lucky enough to work on site back in May and experience the various tunnels, trenches and craters first hand, these really do bring to life the features of the site beyond what could be achieved with traditional photographs.. Thanks for the kind comments Stuart, I’m glad you like the virtual tour. Will you be working on site again next year? I’m planning to visit again in order to extend the tour with addition 360 panoramas of the tunnels as new sections are opened up. Maybe see you there? During historical family search I found my Ggrandfather’s war record. Although he joined the Royal Scots, he was remustered in the field due to him being a miner to trade. He was in 183 Tunnelling Company during the Somme battle and I would be interested to find out more about what his war must have been like? He was sapper John Early from Lochore in Fife a mining village. Good luck with your search and I hope there will be a documentary forthcoming. My wife and I just popped in on cycle ride expecting to be told to go away, not so we were made most welcome the enthusiasm of our hosts rubbed off because we spent 4 hours there with our friends from Pozieres the next day. Five of us will be back in October, hopefully we can help even if only means making the tea. Fantastic site and the panorama 360 is a great feature – brings the excavations to life. Keep up the great work.Thanks for opportunity to see work in progress. Its looking really good guys cant believe the change since last september, see you all next week and in september with our wenches in trenches walk. Hi the panorama is a great addition to the site. Like Conor,I am also visiting in September with Leger .and I think also with the Wenches in Trenches in Mid Sept during the walk . Hi, the site looks really great. In September I am visiting through Leger. I am taking time off school to go, I really can not wait!